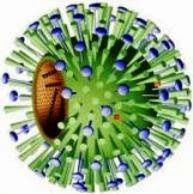 Flu is a viral infection. It's passed on when people breathe in liquid droplets containing the influenza virus that have been sneezed or coughed into the air, or when people touch objects contaminated with the virus. The virus can cause infections all year round, but in the UK it's most common in the winter. There are many strains, some of which are worse than others, such as swine flu (H1N1 strain) which tends to have a more rapid onset, high fevers and gastrointestinal upset and has caused many fatalities, often in previously fit adults. Symptoms include fever, headache, cough, sore throat and muscle aches. They appear quickly, last for about seven days and generally leave you exhausted for weeks afterwards. One minute you're fine, the next you've been knocked for six and are too ill to do anything. It's different from the common cold, in which the symptoms tend to come on gradually, usually affecting only the nose, throat, sinuses and upper chest. When someone has a cold, they're still able to get about and usually recover fully after about a week. Flu can cause serious complications, including pneumonia, and can even be fatal. Everyone over the age of 65. People of any age with lung diseases (such as asthma), heart disease, kidney disease, liver disease, diabetes or lowered immunity. Anyone living in a residential or nursing home.Carers of those at risk of the complications of the flu. The UK is fortunate to have a safe and effective vaccination against the flu, which is provided free of charge by the NHS. Those most at risk are advised to have a vaccination every year. This is because the flu virus changes slightly every year. Despite popular belief, the flu vaccination can't give you flu as it doesn't contain the active virus needed to do this. It's true that some people experience symptoms of a heavy cold at the same time or just after they've had the flu jab. This is simply a coincidence and the symptoms are usually caused by one of the many common cold viruses that are around in the autumn and winter. Remember, it's still possible to suffer heavy colds after vaccination, as the flu jab only protects people from the flu virus, not other viruses. The flu vaccination is available from about October each year. The Uk’s 2010-11 vaccination contains protection against H1N1 strain (swine flu) as well as other strains expected to occur this year. Anyone who thinks they need it should talk to their doctor or nurse. The best way to avoid getting flu is to keep your immune system strong by eating a healthy diet, taking regular exercise, getting enough rest and relaxation and not smoking. You should also avoid people who are coughing and sneezing, especially if they're not covering their mouth and nose. Get plenty of rest. The body uses a lot of energy fighting infections, so resting for the first couple of days gets it off to a good start.Keep warm.Make sure you drink plenty of water to avoid dehydration, and try hot water with lemon, ginger and honey to relieve symptoms such as sore throat.Take paracetamol or anti-inflammatory medicines such as ibuprofen to lower a high temperature and relieve aches. Advice on suitable remedies is available from your local pharmacist. Always contact your doctor if you're not getting better after a few days, if you're unduly short of breath or if you're coughing up blood or large amounts of yellow or green phlegm.